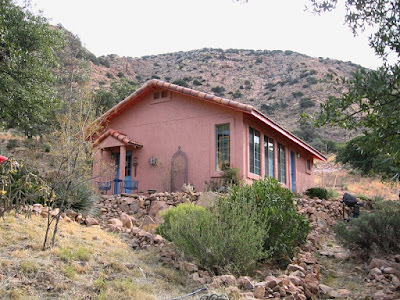 Many of you know that my husband and I go down to Bisbee, Arizona, twice a year to celebrate birthdays. We rent a cottage and either keep busy exploring, or just sit back and relax. 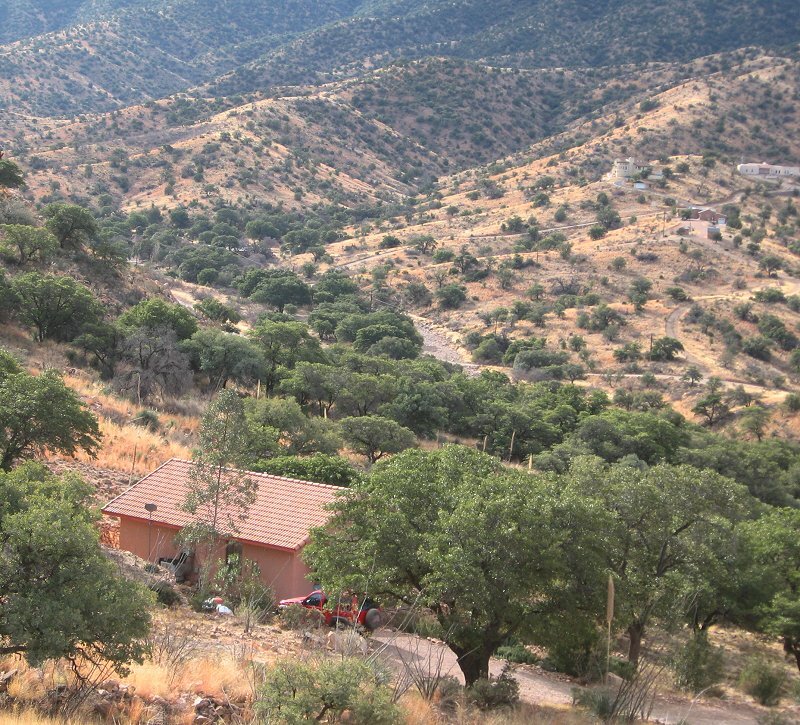 Up to the left you can see the cottage tucked away in the scrub oak up in the Mule Mountains, overlooking the road at the bottom of the canyon that leads to Bisbee. If you see a glimpse of red, that's the Jeep that takes me to The Poisoned Pen. It's also taken us on trails throughout Cochise County, up in the sky islands, and along the border with Mexico. It's so quiet and peaceful in that cottage. No noise pollution. No air pollution. No light pollution. The sky is packed with stars at night. The weather is true Sonoran Desert weather, not warped by the miles of concrete and asphalt of a metropolitan area. Sounds as though I like the place, doesn't it? To the right is another view of the cottage. You can see the big windows that look out over the canyon and mountains. On the left side of the building under the little overhang is the main door to the cottage. If you see some blue outside the door, that's the table and chair I use every summer morning we're there. I bring out a tray with tea, a muffin, a book, and my camera, and sit out there in the shade until the sun comes around and the shade disappears. The following is a (mostly) photographic record of my mornings in the shade this past June. I hope you enjoy it. I've grouped all my visitors together-- insects with insects, reptiles with reptiles, birds with birds, mammals with mammals. I get along just fine with all creatures great and small... as long as they don't try to harm me or mine, and as long as they stay out of the house. Here's looking at you, Mr. Funnel Spider! 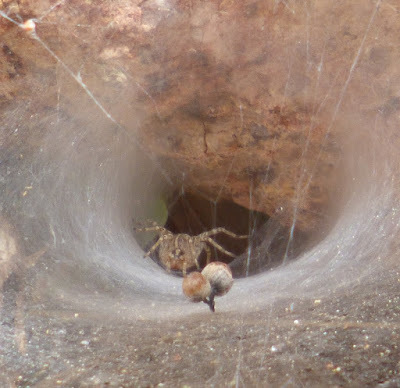 For example, I had no problem sitting a few feet away from this funnel spider, and it had no problem with me. The web looks like a funnel or a whirlpool-- a trap for unsuspecting prey. Unfortunately this particular spider was doomed-- its abode was demolished a day later by an overzealous Welsh Terrier. 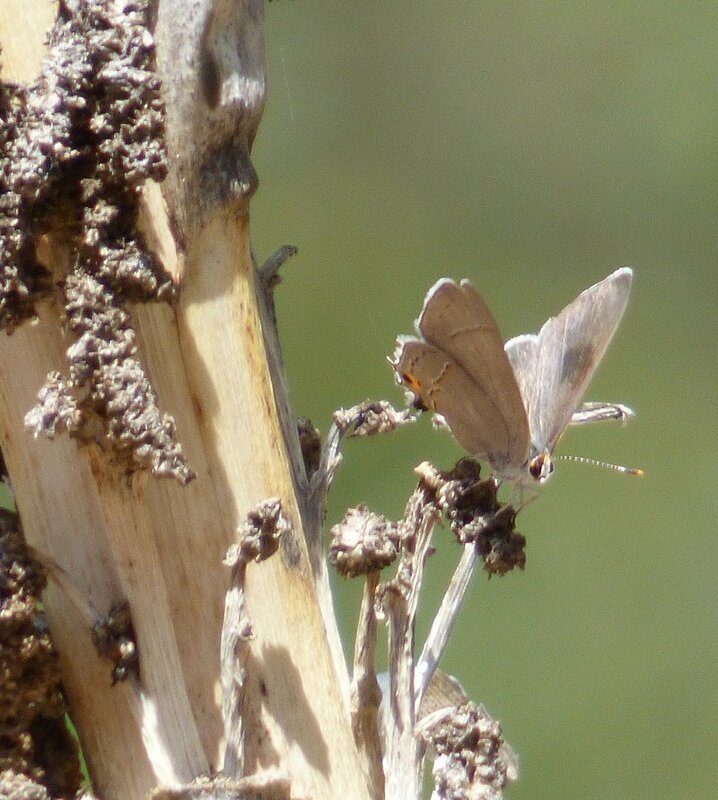 Other multi-legged visitors were of a more pleasing disposition, like this Soapberry Hairstreak butterfly posing on a yucca bloom stalk. That yucca bloom stalk was quite popular with all sorts of critters, including this gorgeous brilliant orange Flame Skimmer dragonfly. 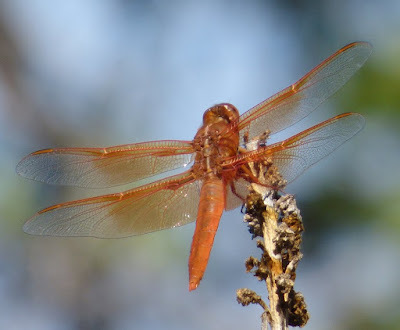 Every time I see light through a dragonfly's wings, I know how the inspiration came for the first person to make a stained glass window. 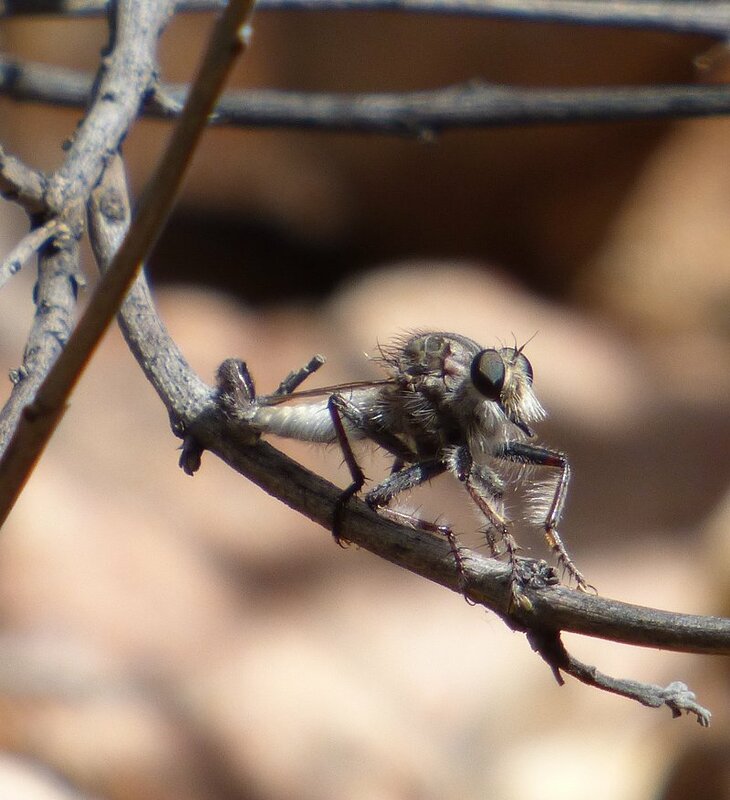 Fortunately this alien-looking robber fly was content to stay a few feet away from me. I've heard that their bites can be nasty, and I'd just as soon that information stayed secondhand, if you know what I mean! These little Desert Grassland Whiptail lizards were everywhere. I like lizards. They eat lots of bugs. They're free pest control, and they don't hurt you. These little striped lizards are quick; they're curious as all get-out; and if they put their minds to it, they can sound like a herd of rampaging elephants when they move through a pile of leaves. The whiptails weren't the only show in town. Far from it. 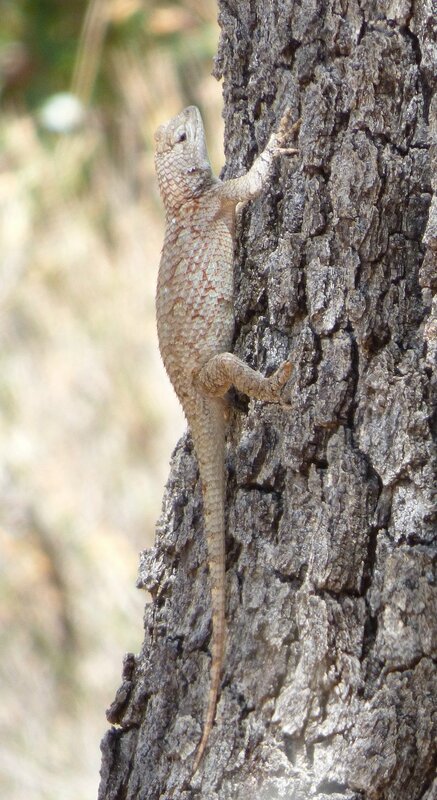 Several of the larger lizards-- like this young Desert Spiny Lizard-- had turned the trunks of several scrub oak trees into highways. And like most human highways, these trunks had rest areas where the lizards would lurk by the wayside of... the ant highways. One evening I looked out the kitchen window to see this pretty fellow. If I thought he would've stayed put, I would've scurried out there to remove those wisps of grass ruining my shot. But I knew better and did the best I could through the window. 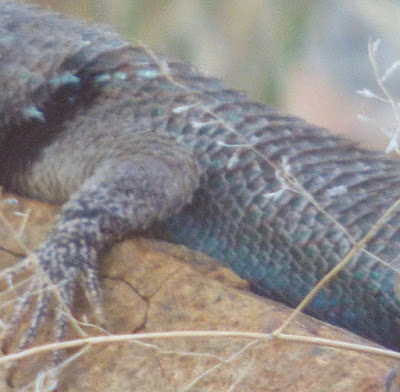 You probably think I'm nuts for calling a lizard pretty, but take a look at his striped gloves, and the spiked turquoise scales around his black collar, and the turquoise on his belly! This little hummingbird proves that humans aren't the only ones who sometimes have a difficult time getting out of bed in the morning! 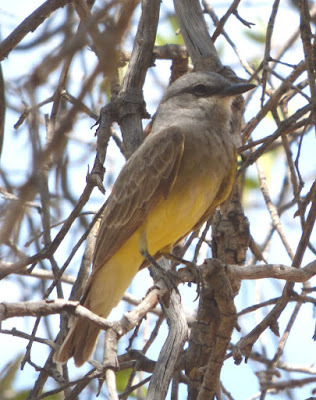 One of the things that was so lovely this June was the fact that I got to see adult birds taking their fledglings out to show them the best places to find food. 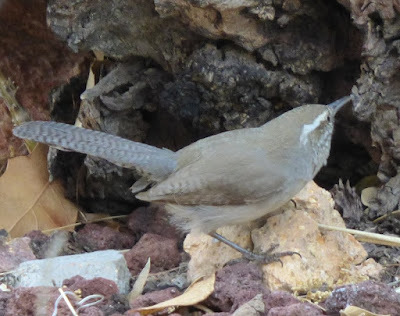 That was the case with the rock wren above. I'd never seen one before, and it's a shame that the rest of the family wouldn't cooperate so I could get them all in the shot. 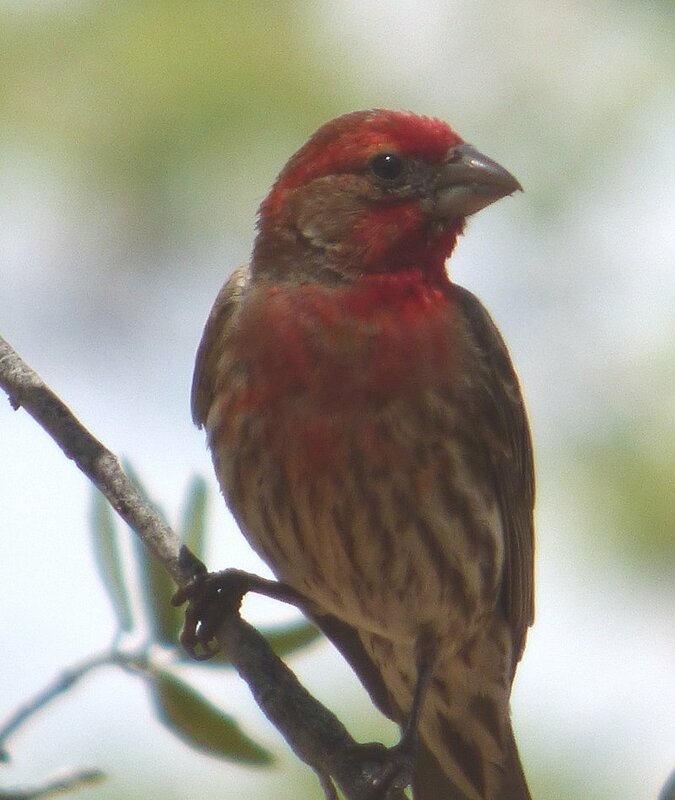 Then there were other birds that were just too shy and stayed up in the scrub oaks-- like this male House Finch. 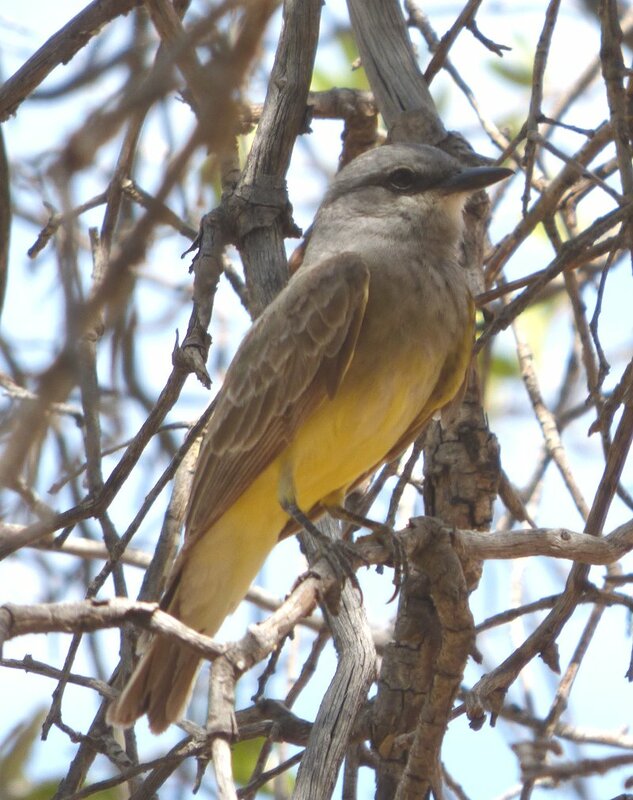 This Western Kingbird would show up at the same time every morning, and we'd spend time on our various perches, staring calmly at each other. 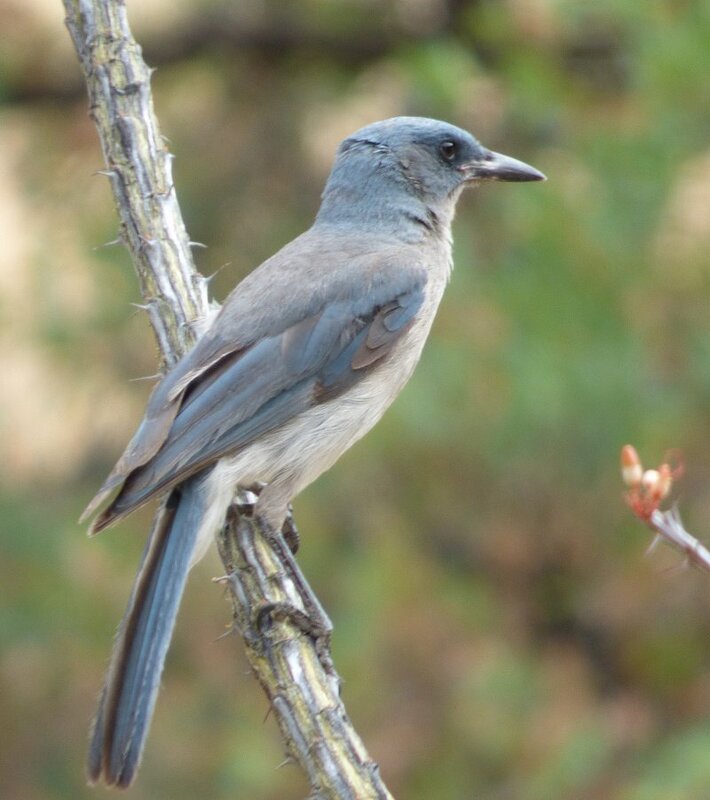 Like any other self-respecting jay, the Mexican Jay is raucous and nosy and full of themselves. 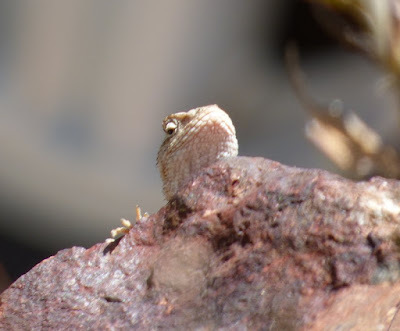 They're also extremely skittish, so I was happy to have a new lens with more zoom to it. It's how I was able to get a decent shot of this guy when he perched on an ocotillo quite a distance away. I also got to watch a Downy Woodpecker family spiraling their way up and down tree trunks. The only decent photo I got, however, was of this young one. What a cute little fluffball! 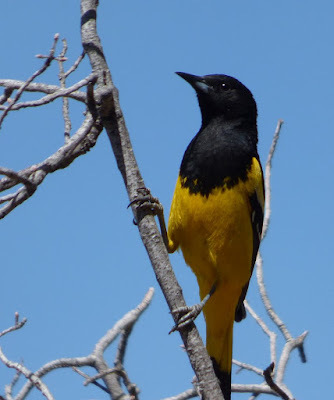 And then I'd be graced with a beauty like this male Scott's Oriole. Isn't he gorgeous? Now, I know this is a rotten photo-- although it does have an almost impressionistic, ghostly appearance to it-- but remember that evening I saw the big lizard outside the kitchen window? Less than fifteen minutes after I sat down from photographing "Mr. Clark," I got the strangest feeling that I was being watched. Again. I looked up and out that kitchen window, and there was a mule deer doe and her half-grown offspring looking in at me! Once again, I put down my knitting and picked up the camera. 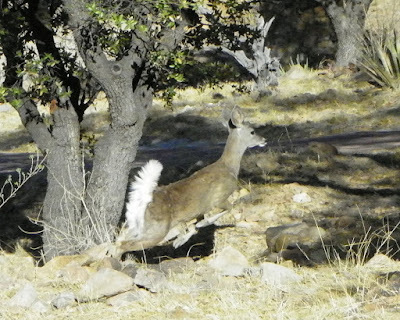 Unfortunately the camera insisted on focusing on the tree branches instead of the deer, thus creating ESPs (Evil Stick People). Blast! 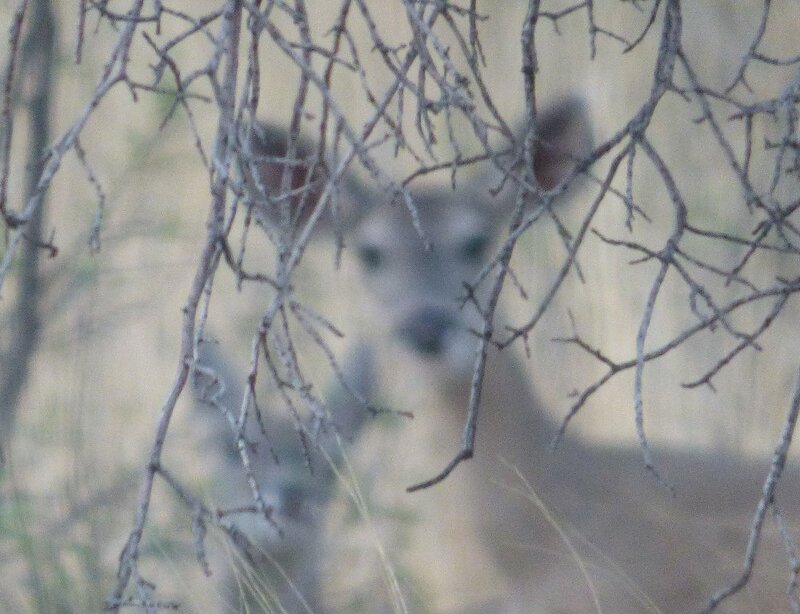 Like this time a young deer got within ten feet of me while I was sitting in my favorite shady spot. If you look closely back in the darker shadows, you'll see his mother's ears. That whole magic moment was spoiled when a nearby dog barked and scared them away. Okay... you've made it all the way to the end, for which I thank you! Did I show you all the critters that beat a path to my door in June? Nope. I'm convinced that I've probably shown you too much. But one thing is certain-- I hope you've enjoyed your visit, and I hope you understand why I love going down there so much! Thank you, Cathy. What a wonderful narrative and the photos are great. 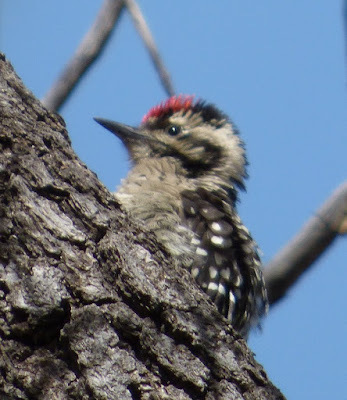 Love those birds, especially the baby woodpecker. 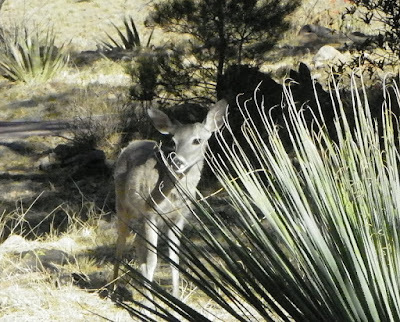 And the mule deer are adorable, too. It's very understandable why you both visit that cabin twice a year in a no-pollution zone, but just bursting with all kinds of flora and fauna -- life. It's a great little pick-us-up when we go down there, Margot. Very nice. We've never been to that part of Arizona. Can see why you love it. Thanks for sharing with us! It's a bit remote. Cochise County has some of the least visited monuments in the country, which is sad in one respect and wonderful in another because it means they're never overrun with tourists when Denis and I are there. Not crazy about insects, though I tolerate them, much prefer lizards and birds. Had no idea you had Orioles out there, very pretty. 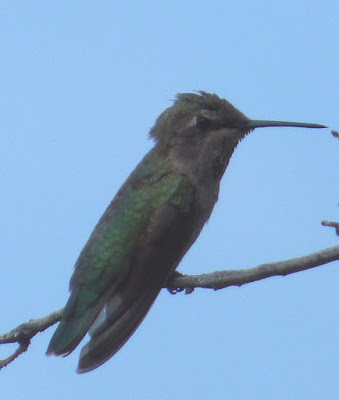 Cochise County, Arizona is one of the prime birding spots in the entire world. There's a little something for every bird lover there-- especially in winter. LOL! Evil Stick People. I hadn't heard that one before. There are times when manual focus is an absolute must. I hate when autofocus decides I'm not really wanting to look at the thing in the foreground/background. Thanks for sharing these great shots! 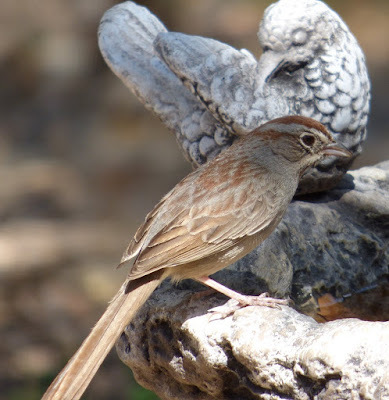 I especially love your bird photos! We only drove through Arizona while moving here to California, but I really would love to take a vacation there. Peace and quiet, and desert beauty.. I can see why you enjoy it. There are plenty of great spots here in Arizona to vacation-- and you don't need to get close to Phoenix or Tucson unless you want to. Great photos Cathy. I can see why you would want to return. Thanks for this, Cathy. I've never been to Arizona, though I traveled across the country - many years ago. I have a friend who hails from there and I always imagined when she went home to visit relatives that they would be cowboys. Was I disappointed when she told me they lived in a suburban setting like everybody else. Ha. I love that Scott's Oriole. So beautiful. In fact, I enjoyed looking at all your photos. That fuzzy one of the deer is actually rather wonderful. I had a friend and her boyfriend come for a visit many years ago. One night the two of them decided to go barhopping and came back laughing at all the "cowboys" they'd seen. I had to remind the two of them that we really did have cowboys in Arizona, and that there were ranches on the outskirts of Phoenix. They're probably gone now, but there are still plenty of ranches further out.